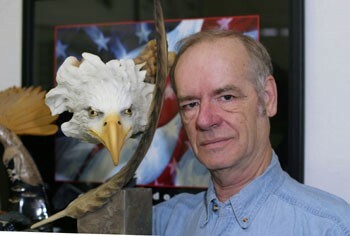 Political Aerie: Newspaper owner and Napa mayoral candidate Harry Martin poses with one of his many pieces of American eagle statuary. The unprepossessing facade of the Napa Sentinel sits just east of the busy Highway 29 wine country thoroughfare in central Napa. Stepping inside the one-story building that houses this low-budget weekly community newspaper, visitors find a warren of small, cluttered offices. Past issues of the newspaper are stacked high on every available surface, telephones ring sporadically and an aura of gravity hovers in the air. Welcome to the world of Harry Martin, owner and publisher of the Sentinel and just maybe the next mayor of Napa. A controversial figure, Martin is different things to different people. To some, he's a crusading journalist who isn't afraid to tackle controversial topics such as mind control, cults and black helicopters in the pages of his newspaper. To others, he's a rumor-mongering conspiracy theorist with connections to intelligence agencies, militias and other right-wing groups. To the working people who read his newspaper, he's a populist hero. To Napa's power elite, he is a blight on the town. Love him or hate him, the one thing that can be said for certain about Harry Martin is that he cannot be ignored. His current run for mayor of Napa has split political, business and civic groups--to say nothing of the general public--on his character and ability to lead the upscale center of U.S. wine culture. Nevertheless, many within the community give Martin a better-than-average chance at success when the dust clears and all the votes are counted on March 8. Martin's office sits immediately to the left of the front door and is an eclectic mix of chaos and practicality. Two San Francisco 49ers football "helmet" chairs await visitors. Dressed in a fashionable gray suit with suspenders, a crisp white shirt and a power tie, the tall, lean Martin has on this day eschewed his normal attire of jeans and casual shirt, due to an earlier campaign engagement. His calm, warm and engaging demeanor belies the image that he is a loose cannon, which his opponents, and many within the community, would have voters believe about Martin. Depending on how one views Martin, scheduling his interview with the Bohemian in the offices of the newspaper he owns is a fitting act of either transparency, defiance or humility. The case can be made that much of what is known about Martin within the Napa community, both negative and positive, stems from his work with the Sentinel. Established in 1985, this 20-year-long experiment in journalistic expression is but one of many such endeavors he has had over a long career in the news business. "I've been a writer all my life," Martin, 65, declares proudly. Born in San Francisco, he has worked in newsrooms in Australia, Hawaii, Alaska and around the Bay Area, including a stint in the 1960s as city editor at the Napa Valley Register, now one of his most vocal critics. From the very beginning, his willingness to explore controversial topics in the pages of the Sentinel has drawn readers like moths to a flame, even as it alienated more skeptical observers. For instance, there was the string of stories in the mid-1990s on sightings of black helicopters over the Napa and Sonoma hills that initially brought scorn from nonbelievers, including more than a little eye rolling from the wine-and-cheese set. Martin, who was once publisher of Defense Systems Review and Military Communications, stands by the story, citing evidence that the aircraft did indeed belong to the U.S. government and serviced a secret governmental communication site and bunker complex hidden in the vehicle-challenged hillsides. The purported location of the center, on inaccessible Bureau of Land Management property, raised as many questions as answers. In the early 1990s, Martin and writer David Caul co-authored a 13-part series in the Sentinel on mind control, detailing the allegedly clandestine history of chemical use and other techniques to control the thoughts and actions of citizens by governments around the world. Another series of articles involved alleged malfeasance within the U.S. Justice Department and the CIA and the sale of a sensitive computer program to the Iraqis prior to the first Gulf War. Known as the Inslaw case after the company that developed the software, the details of the affair involved a CIA computer expert, his wife (who was arrested in Napa on charges relating to the case), an ex-Israeli intelligence officer and had all the intrigue of a James Bond film. With dogged persistence, Martin has challenged orthodoxy, the power elite and perhaps even common sense to seek answers for questions that others refuse to acknowledge or even pursue. That's earned him praise from both the left and the right. It's also earned him derision. Political Research Associates (PRA), a national organization that keeps tabs on the political right, was highly critical of Martin's Inslaw series. "An analysis of the content and style of the Martin articles raises questions about his credibility as a reporter," PRA notes in its online publication Public Eye. "Martin uses classic leaps of logic and propaganda techniques in his reporting." "Sometimes [as a newspaper writer], you can be ahead of the curve," he laughs. "I told the Napa City Council 10 years before it occurred that the Napa State Hospital would become a penal facility. Everyone on the council said I was a nut. No one would believe it. I had information from my investigative reporting including everything from the number of patients to the height of the barbed wire fences. Ten years later, they thought maybe I wasn't so dumb after all." His willingness to tackle subjects others might find strange, even wacky, speaks volumes about his dedication to craft--to say nothing of the ample ammunition his work gives those who oppose his political aspirations. Yet Martin is not a one-dimensional creature apt to go off half-cocked on the latest lunacy du jour from the newswire of the bizarre. In his own way, he is a professional journalist, with his own peculiar brand of justice that extends through his writings into his public life. To win the mayor's seat, Martin must defeat fellow councilmember Jill Techel. With eight years on the council and backing from the Napa Chamber of Commerce and the Napa Valley Register, Techel is in an enviable position in terms of visibility and high-profile support. While her website lists no formal endorsements, there are testimonials from Congressman Mike Thompson, Napa County supervisor Bill Dodd, Napa County sheriff Gary Simpson and outgoing Napa mayor Ed Henderson. The third candidate in the race, the progressive-minded Vincent "Grasshopper" Blake, is expected to finish a distant third. A Feb. 3 story in the Register listing the candidate's fundraising successes paints a clear picture of the opposition facing Martin and his backers. Techel's list of donors runs six hefty paragraphs and represents a who's who of Napa city and county politicians, business people, wineries, upscale eateries, banks, attorneys and others who were willing and able to shell out cash to support her bid for the mayor's seat. Martin's list runs only three short paragraphs and features a preponderance of retirees, blue-collar workers and other small contributors. The obvious question is why does Martin's support within the community--financial donations aside--seem to be growing in the face of such well-heeled opposition? Therein lies the rub. Regardless of how hard the Napa valley tries to project itself as the premier destination point in the world for wine aficionados, Napa is at the most basic level a farming community. A good portion of the population who live in the valley are unpretentious, hard-working people with little connection to the aspirations of those whose business is promoting the area as something other than a great small town for raising a family. Even though Martin's stance on controversial issues and his investigative reporting have alienated whole segments of the city's population, most notably the power elite, the release of the Sentinel on Friday mornings is awaited by many of Martin's followers as the highlight of Napa's journalistic week. With a heavy dose of seniors and blue-collar workers in his reading audience, he enjoys a loyal base of fans, many of whom extend their support to the ballot box. Martin was first elected to the Napa City Council in 1994, retaining his seat in 1999 and 2003. This is his second attempt at the mayoral seat, and even if he loses this time around, he will return to the council to serve out the remainder of his two-year term. He currently serves as the city's vice-mayor, a position he has held twice before, and has racked up an impressive résumé of service. During the past 11 years on the council, he has held positions on the Napa Sanitation District, Napa Parking Authority, Local Agency Formation Commission, Teen Alcohol Appeals Board and as an elected member of committees to the CALAFCO, Flood Control Executive Board, Housing Authority, Redevelopment Council, Farm Workers Housing and others. Martin's willingness to tackle the hard issues facing the city is playing well with his support base. His positions on Napa's shrinking operational budget, rampant development within the city limits, a dwindling downtown revenue base and what some perceive as a war between the haves and the have-nots has increased Martin's popularity and his reputation as a savvy political operative. Most troubling to his two mayoral opponents is the virtual sweep of group endorsements he has pulled in to his camp over the past several months. Included in his endorsement base are associations representing Napa city employees, Napa city firefighters, Napa police officers, as well as the Peace Officers Research Organization of California, the Service Employees International Union, the Plumbers and Pipefitters Union, and the Napa County Farm Bureau, and financial support from Napa-Solano Building Trades Council. Martin's success comes partly from a no-nonsense, down-to-earth personality that allows him to speak to people on an equal footing. As a small businessman, he relates to the needs of his supporters and understands the direction they think the city should take in coming years. "What this election is about is equality," Martin said. "The problem is the haves and the have-nots. I get less support from the bigger businesses and more from the mom-and-pop stores. They're the biggest employers in America," Martin says, noting that small business owners are the bedrock of any community. Quality of life also ranks high on the minds of Martin's support base. Many of the challenges the city faces come from the unique history of Napa's past. As an agricultural region, there has always been a lively interest in protecting the agrarian nature of the community. The town literally grew up in the midst of apple and prune orchards, Christmas tree farms, and more recently, vineyards. When the city incorporated, many existing plots of farmland were contained within the city limits and continued to operate as producing tracts of agriculture land. As land prices escalated in the 1990s and the flow of newcomers into the city increased, Martin, working with the city council, was instrumental in placing a rural urban limit (RUL) line into the city charter. The RUL restricts city growth beyond its boundaries without a vote of the people. Since 1999, the city's expansion has been restricted to infill, creating a frenzy of buyouts of existing properties and open land within the RUL. Neighborhoods that traditionally enjoyed a mix of housing and farmland suddenly saw vineyards disappearing, replaced by over-crowded developments with homes priced just under $1 million. Martin holds current and past councils partly to blame for the community's anger over the developments. "On the issue of infill, we've got to respect our neighborhoods," Martin says. "We passed an ordinance two years ago that required developers to submit a footprint of the proposed development so we could monitor them and protect the neighbor's privacy. Presently, we're not seeing the footprints [before developments begin]. Our neighborhoods are falling apart. You need to have a balance and listen to the voices from each area [to help retain] their privacy and character." Increased density of homes produces unique concerns for any neighborhood and Martin sees associated problems such as crime, street and sidewalk repair, traffic, water runoff and overburdened school rosters as only the tip of the iceberg. As the developments are completed, Martin says connecting roads to adjacent neighborhoods are creating increased traffic problems throughout the city. He sees this situation as unacceptable. "It ruins the character of the neighborhoods." Closely tied to the issue of infill and neighborhood development is the looming dilemma of affordable housing, a matter he says the city has failed to address adequately thus far. While Martin and an overwhelming majority of Napa residents still support the RUL and the objective of retaining the agrarian nature of the countryside outside the city limits, one of the RUL's consequence is that it limits the number of available lots to build upon. With real estate prices skyrocketing across the county, developers are loath to take up the affordable-housing crusade. Nevertheless, Martin notes, the need for affordable housing is not going to go away--indeed, it's mandated by the city's membership in the Association of Bay Area Governments, which requires a certain percentage of homes within the city be designated as affordable housing. "The city keeps allowing developers to buy up available land," Martin says, producing homes far out of reach of many local homebuyers. Already, the community has seen an increase of service personnel that work within the city but live outside the area, where rent and housing prices are lower. Martin wants the city to increase efforts to purchase land to be designated specifically for affordable housing. He supports the concept of building and selling affordable housing that employs sweat equity in the process. Under these terms, qualified homebuyers would purchase homes with fewer amenities below the current market value. Once the sale is finalized, the new homeowner is free to make changes or alterations at his own expense, either by contracting out the work or doing it himself. Martin believes this process would provide residents the opportunity to buy an affordable home without the looming specter of endless debt hanging over their heads. Martin is the squeaky wheel in Napa's political world, attacking issues and institutions others find sacrosanct. His verbal opposition, both in his newspaper and on the council, is legend, and, some might say, mean-spirited and obscene. Before COPIA: The American Center for Wine, Food and the Arts opened in 2001, perhaps no one in Napa was more opposed to the project than Martin. The center signals "the death of a town and the birth of city," Martin told the San Jose Mercury News in 1999. "It's crème de la pooh pooh. The whole wine culture is about snobbism. It's an artificial society. They are going to hold seminars on how to decorate your table. They want this to be another Carmel, a ticky-tack town full of little boutiques." Still decrying the "arrogance" of some involved in the project, Martin's stance has mellowed somewhat over the years, but the issue continues to be a crusty scab on Napa's political and social landscape that breaks open periodically, causing verbal barbs to fly on both sides. An issue closely tied with the COPIA controversy is Napa's much-beleaguered town center. Never one to run from a fight, Martin has been a longtime critic of the city's efforts to revitalize Napa's anemic downtown business climate. Citing the city's 40-year effort to redevelop the area, he sees the efforts as ill-placed and unproductive, criticism his political opponents take to heart. "There have been 18 studies done on how to redevelop downtown. The 19th is already funded," Martin says. "Redevelopment of the Napa River is the key to the future of Napa, not pouring more money into redeveloping the town center." Pinning down Martin politically isn't easy; as PRA notes, his written work has influenced members of both the left and the right. Asked how he sees himself politically, Martin's answer is understandably complex, coming from a man whose passions span a vast array of topics and subject matter. For years, when asked his party affiliation, Martin refused to answer, but now admits he's a registered Democrat. He supports Sen. Barbara Boxer and backed John Kerry in the recent presidential election, although he liked Gen. Wesley Clark as well. He calls himself a fiscal conservative but a liberal on human rights. "I'll protect your dollars, but I'll protect your personal rights even more," Martin says. Martin appears to be one of those unique individuals that people either actively hate or ardently adore. His views, while often contrary to the norm, are based on deep convictions on what he sees as right and just for the masses. Detractor's comments aside, his track record and current support base speak volumes about how members of the community perceive him. Whatever fate awaits Harry Martin on March 9, the morning after the election, his is a voice that will not be silenced easily. From the March 2-8, 2005 issue of the North Bay Bohemian.